"This ice cream is great for lactose intolerant or dairy-allergic people." Whisk cream of coconut, coconut milk, and flaked coconut in a bowl. Cover and refrigerate for 8 hours or more. Pour the chilled mixture into an ice cream maker and freeze according to manufacturer's directions until it reaches "soft-serve" consistency. Melt the chocolate in a microwave-safe glass or ceramic bowl in 30-second intervals, stirring after each melting, for 1 to 3 minutes (depending on your microwave). Slowly drizzle chocolate into ice cream what machine is churning. Transfer ice cream to a one- or two-quart lidded plastic container; cover surface with plastic wrap and seal. For best results, ice cream should ripen in the freezer for at least 2 hours or overnight. Make sure when choosing your dark chocolate that also has no dairy in it. Many dark chocolates contain milk solids. Also read label on coconut milk, some are actually made with milk. This was lovely! The teenager called it AMAZING! I'll be making this one again. Thank you Dana. This is as easy as it looks. 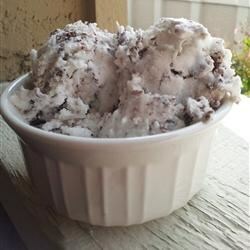 I added chopped dark chocolate almonds the last few minutes of the ice cream cycle - delicious!